[Napoleon's planned invasion of England.] Three rough drafts of royal proclamations, drawn up for the Privy Council by Attorney General Spencer Perceval, dealing with contingencies relating to the administration of justice in the event of invasion. The present item is a significant document in British history. 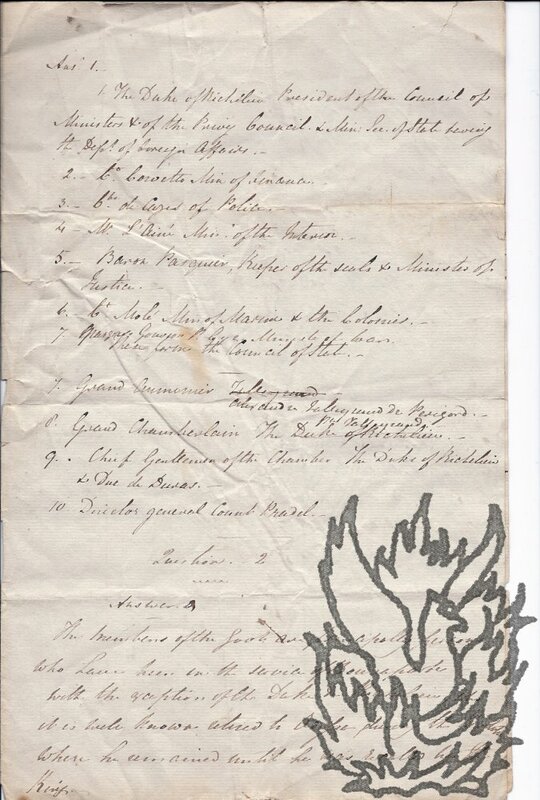 It comprises the annotated rough drafts of three royal proclamations, drawn up for the Privy Council by the Attorney General (and future Prime Minister) Spencer Perceval (1762-1812). The document, which appears to be unknown, is in Perceval's autograph, and deals with matters relating to the administration of justice in the event of a French invasion. Perceval was appointed Attorney General by Addington on 15 April 1802 and left office as a result of Pitt's death on 12 February 1806. Ludovici Luciani Bonaparte [ Louis Lucian Bonaparte ], 1813–1891), third son of Napoleon's second surviving brother, Lucien Bonaparte, philologist and politician. Pp.Title; blank; 56; blank, folio, full calf, dec.g., recased (rescuing most of title), marbled eps, corners bumped, binding still attractive, faint foxing, mainly good condition. INSCRIBED BY AUTHOR "Presented to B. Docking Esq | By Prince Louis Lucien Bonaparte. | London the 9th of December 1857." No other copy currently on the market; six recorded in British and Foreign libraries. Apparently not held by the Bibliotheque Nationale. [Pierre Daru [Pierre Antoine Noël Bruno, Comte Daru], French soldier and author.] Autograph Letter Signed ('Cte Daru') to printer Firmin Didot, concerning the printing of 'la Copie des vers que j'ai lus à l'institut', with reference to 'M Raynouard'. 26 April 1829. No place. 1p, 4to. On recto of first leaf of bifolium, the verso of the last leaf of which is addressed by Daru 'à monsieur | F. Didot père & fils | rue jacob No 24 | Paris'. In good condition, lightly aged, with stub from mount adhering. Sixteen lines of text. The text is in French, and concerns 'la Copie des vers que j'ai lus à l'institut pour imprimés avec les autres pièces lues a cette place', which he discussed with 'M Raynouard' (François Just Marie Raynouard) the night before. Waldburg-Truchsess appointed Beethoven Kapellmeister to the King of Westphalia when serving as the King's Chamberlain, and was one of the four Commissioners responsible for supervising Napoleon's exile in Elba. 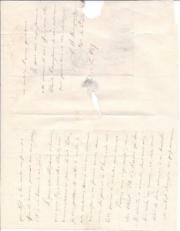 The letter is written on the eve of his return from the Hague, where he had been Prussian ambassador since 1827. 1p., 8vo. Bifolium. In fair condition, on aged paper with wear along one edge, and damage to second leaf caused by breaking of seal (not present). [ Sir Andrew Hamond, Comptroller of the Navy, on 'the Report of Buonaparte's assassination'. ] 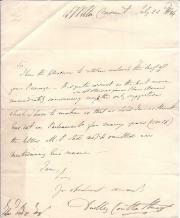 Autograph Letter in the third person to Lady Spencer, regarding a report of the assassination received from a Madeira merchant. No place. 29 December [ 1798 ]. 2pp., 12mo. In fair condition, on aged and worn paper. Docketed: '29th. Decr 98 | Returned the Inclosure with Lady Spencer's thanks'. He is enclosing the letter (not present) which 'he mentioned from the Madeira merch[an]t. - The Postscript of which takes notice of the Report of Buonaparte's assassination having reached that Island on the 19 Novr. which is two days later than only, than the time the Report reached Constantinople.' The letter is 'on private business', and he would have forwarded it, had not business in the House of Commons kept him from Fulham. [ Lord Dudley Stuart, politician. ] Autograph Letter in the third person to the editor of The Globe newspaper, requesting the insertion of an article. On letterhead of the Literary Association of the Friends of Poland, Sussex Chambers, Duke Street, St. James's. 2 June 1843. 1p., 12mo. In good conditionl, on lightly-aged paper, with traces of stub along one edge. Reads: 'Lord Dudley Stuart presents his Compliments to the Editor of the Globe, and would feel greatly obliged by the insertion of the accompaning article in his Columns tomorrow (Saturday)'. The Association was founded in 1832 by the Scottish poet Thomas Campbell and the German lawyer Adolphus Bach. [ Napoleon Bonaparte. ] 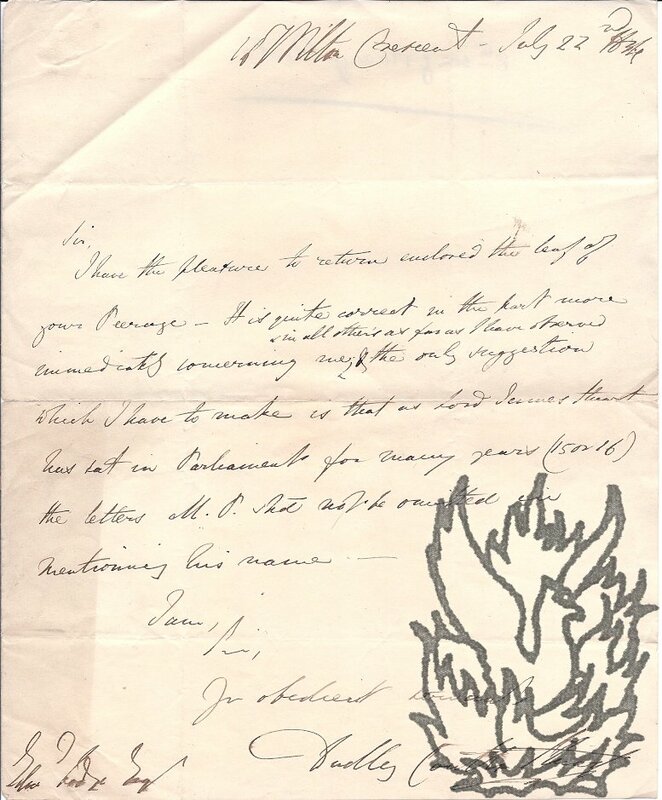 Autograph Letter Signed from 'J Thompson | late Capt. 4th East York L[ocal]. M[ilitia]. ', presenting John Crossley of Scaitcliffe with 'Bonaparte's Star of the Legion of Honour'. 1p., 4to. Bifolium. In good condition, lightly aged. The reverse of the second leaf, with seal in black wax, is addressed to 'Capt Crossley | &c &c &c | O L M', and the foot of the letter to 'John Crossley Esqre | Capt: Oldham L: M:' (Crossley, the commanding officer of the Oldham Regiment of Local Militia, built up a notable collection of military memorabilia, which was dispersed after his death.) The letter begins: 'With this you will receive the interesting little "Bijou" - Bonaparte's Star of the Legion of Honour for which I beg a place in your curious Collection. [ The Crossley Collection. ] Autograph Letter Signed from 'Thos Hampson', presenting John Crossley of Rochdale with a snuff box made by 'the French prisoners confined in this country during the late war'. Drake Street, Rochdale. 14 October 1822. 1p., folio. Bifolium. In good condition, lightly-aged with strip from stub adhering to one edge. Addressed on reverse of second leaf 'To | John Crossley Esqr. | Rochdale.' Crossley, the commanding officer of the Oldham Regiment of Local Militia, built up a notable collection of military memorabilia, which was dispersed after his death. [ Lord Dudley Coutts Stuart, Liberal politican and husband of Princess Christine Bonaparte. ] Autograph Letter Signed ('Dudley Coutts Stuart'), undertaking to visit the pianist Charles Salaman. 34 St James's Place [ London ]. 17 July 1848. 1p., 12mo. On aged and lightly-worn paper. It will give him great pleasure to wait upon Salaman and his sister, and he will certainly do so 'unless absolutely prevented' by the House of Commons, which he hopes will not be the case. The word 'Lord' has been added in a contemporary hand before Stuart's signature. [ Victor Perrin, duc de Bellune, maréchal d'Empire. ] Autograph Letter Signed ('Le Maréchal Victor'), addressed to 'Monseigneur', regarding the advancement of a member of the Duverger family in the service of the King of Westphalia. 2pp., folio. In fair condition, on aged paper. He writes that two of his aides-de-camp belong to the 'famille distinguée' of Duverger, and asking for assistance in obtaining preferment for a third in the service of the King of Westphalia. The document is annotated by the recipient at the head of the first page. [ Abbé Sieyès, theorist of the French Revolution. ] Autograph Document Signed ('Sieyes'), an extract from a speech, headed: 'Extrait de l'addresse de la Section des Tuilleries à la convention nationale | le 1er 7bre l'an 1er de la république'. Without place or date [ 1780s?]. 1p., 8vo. In fair condition, on aged paper. The entire document is in Sieyès' hand. Beneath the heading is a nine-line transcription, within quotation marks, followed by: 'Certifié conforme a la minute déposée sure le Bureau | Sieyes'. Biographical note in pencil on the reverse. [ The Broadley Napoleon Collection or 'Collectanea Napoleonica'. ] 'A Catalogue of the Extensive and Important Collection of Napoleonic Books, Autographs & Engravings formed by the late A. M. Broadley, Esq., of the Knapp, Bradpole, Dorset'. Auction on 7 and 8 December 1916 by Messrs. Hodgson & Co. At their Rooms, No. 115, Chancery Lane, London, W.C.
[4 + 53 + 2] pp., 4to. Frontispiece photograph: 'A group of volumes from the Broadley Napoleon Collection | Showing the style of binding.' In printed wraps. In fair condition, aged and worn, with rusted staples and slight loss to wraps at foot of spine. Index at rear. The main body of the catalogue paginated 31-83, this being 'The Second Portion' of the sale of Broadley library. [Rev. Dr George Croly.] Autograph drafts of three passages from an anonymous article in Blackwood's Magazine entitled 'Russia', dealing with Napoleon Bonaparte's coronation as Emperor of the French. and his entry into and retreat from Moscow. 3pp., 8vo. Bifolium. Very good, on lightly-aged paper. Unsigned, but certainly in Croly's hand. The first page is headed: '- for tho' the Old Law was established in the promises of temporal prosperity, yet the gospel is founded in temporal adversity'. The three extracts, fiercely critical of the French emperor, follow over a total of 61 lines, with a few minor emendations. 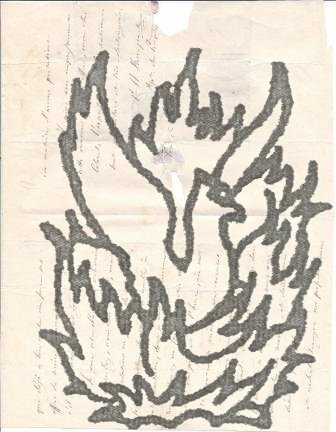 Holograph copy of poem (signed 'R. M.') by Richard Mant, beginning 'Bow, Britons, Bow the haughty head' ['War Song'], written out for Anna Maria, wife of George Parker, Vicar of Bampton, and like Mant a Fellow of Oriel College, Oxford. Oriel College, Oxford. 15 June 1803. 3pp., 4to. On bifolium. Very good, on lightly-aged paper, with thin strip of paper from mount adhering to reverse of second leaf, which is addressed, with half of a black wax seal, 'For | Mrs. Richards | Bampton.' This copy was made within a month of the composition of the poem, for the wife of a fellow Fellow of Oriel College, Oxford. The recto of the second leaf carries the following note by Mant: 'with Mr. Mant's best compliments to Mrs. Richards. | Oriel Coll. June 15th. 1803.' Beneath this, in a contemporary hand (presumably that of Mrs Parker): 'Afterwards Bishop of Down & Connor'. Dimensions of tile 16 x 12 cm. Dimensions of print 14 x 10.5 cm. The photographic image has been reversed, with Napoleon's left hand draped over the chair. In good condition, with white label with word 'Napoleon' pasted to reverse. In remains of light-green card box. Contemporary coloured 'Sketch of the Situation of the TOWN of ST. JEAN D'ACRE, with the position of the FRENCH besieging ARMY under the command of General BONAPARTE and the BRITISH SQUADRON co-operating with GEZZAR AHMET PASHA in its Defence [...]'. On paper watermarked 'J WHATMAN | 1816'. A fine plan, so neatly and delicately drawn that it could easily pass for an engraving. The title concludes: '[...] its Defence under the Command of SIR SIDNEY SMITH. Kt. &ca. &ca. &ca. - on the 2nd: day of May 1799.' In landscape on one side of a piece of laid paper, 29 x 42cm, with the plan itself within a 19.5 x 32.5cm border. The drawing and the precise and detailed lettering are in ink, the whole coloured in grey, brown, pink and blue watercolour. On aged and lightly-creased paper, with a couple of small unobtrusive holes. On a scale of one and a half inches to half a mile. One page, c.11 x 23cm, fold marks, irregularly trimmed with loss of most of imprint, heavy staining, but text clear and complete. Manuscript translation from Rostopchine dated 'Hitchin 1856', second manuscript translation undated. First pamphlet printed in Hitchin by C. Paternoster, Sun Street; 1858. Second pamphlet (by 'J*** C******') by C. & T. L. Paternoster; undated. The two translations, in the same original red leather notebook, totalling 226pp., 12mo. Good, on lightly-aged paper, in worn binding. The first translation in the volume is a fair copy, without corrections, of a work published in French in 1823 as 'La Vérité sur l'Incendie de Moscou; par le Comte Rostopchine' (Paris: Ponthieu). Neither Curling's nor any other English translation appears to have been published. The second translation (the printed version of which is the first of the two pamphlets) is heavily corrected, with seven pages of additions loosely inserted. An Unmatched Private Historical Collection of Sixty Original Drawings and  Autograph Letters and Manuscripts. English. Foreign. Arranged alphabetically and illustrated with  Portraits [of John A. Sainsbury, primarily Napoleonic] &c &c.
12mo, 40 pp. In original brown wraps, printed in green ink on the front with the British royal crest, and on the back with that of Napoleon. Yellow endpapers. Text clear and complete. A fair, tight copy, on aged paper, in worn wraps. Illustrated title-page in red and black. In manuscript on reverse Sainsbury has written: 'J. S. | 13 Upper Ranelagh St | Eaton Square | This Collection is offered at One Half it's Cos - | Viz 1200 Guins.' The text begins with a two-page description of 'Drawings and Proof Engravings. Important scenes in the French Revolution' by J. 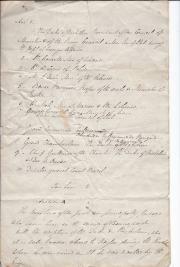 Draft manuscript, docketed 'Answers to Queries', giving detailed information (by a secretary for a British minister? ), regarding the nature and set-up of the newly-restored Bourbon government in post-Napoleonic France. On paper with Britannia watermark and 'W M | 1816'. Folio, 4 pp. Bifolium. Text clear and complete. On aged and creased paper, with some wear and chipping to extremities. Previously folded into a packet docketed in a contemporary hand 'Answers to Queries'. The first page begins with 'Ansr. 1. ', a list of ten ministers, from '1. The Duke of Richelieu President of the Council of Ministers & of the Privy Council & Min: Sec: of State having the Dept. of Foreign Affairs.' and ending with '10. Director general Count Pradel'. P. 1 also features 'Question 2 | Answer A', beginning 'The Members of the Govt. 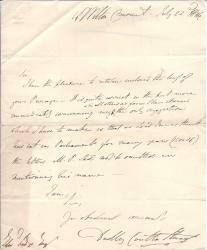 Autograph Letter Signed from 'Dudley Coutts Stuart' [Lord Dudley Stuart] to the genealogist Sir Edmund Lodge. 22 July 1834; Wilton Crescent, London. 4to, 1 p. 7 lines. Clear and complete. Fair on aged and lightly-creased paper. He is returning 'the leaf of your Peerage', which is 'quite correct in the part more immediately concerning me & in all other's [sic] as far as I have observed'. He makes a suggestion regarding Lord James Stuart'.